Cosmo Academy has set a test for ten of its applicants to survive on a spaceship for 2 months. But there is an eleventh member aboard. Based on one of the best works of Moto Hagio, whose sci-fi manga often played games with gender. In this case, in a future academy training people for space travel, the entrance exam comes down to a 53-day training flight with a crew of ten. When the mission starts, however, there are eleven on board. They need to figure out who the odd man is and why he's there; not to mention inconvenient power outages, bouts of temperament between applicants from different planets, and Frol. This student has long blonde hair and a far too pretty face, but is flat- chested and declares himself to be a male. Sorting out that question is perhaps the most important part of the anime: what makes up gender in the future, and--by extension--in the present. This has made Hagio a major manga artist, and this anime captures her story. The anime was dubbed back in the 1980s, and the dub has limitations. Among these is Frol's being given a Texas accent--which was for a time a convention meant to set apart characters who spoke in a western Japan dialect (Kansai). 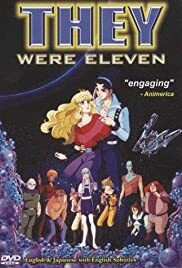 Still, for me this is part of a trilogy of shoujo sci-fi--including Saki Hiwatari's classic "Please Save My Earth" and the seldom-seen "E.Y.E.S. of Mars".